I am all about showing you how to save money, first and foremost at the holidays. Save money by making Homemade Holiday Gifts. 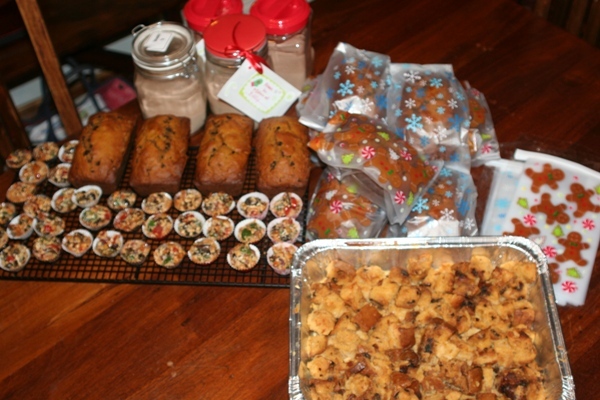 Plan a Baking Day like we did and to get it all done! Check out the progress on my baking days at the links here, here and here. Gift List – Write out a list of what you plan to make. Grocery List – Go through recipes and count ingredient amounts and make sure you have enough to make each recipe. Gift Wrapping – Decide how you are going to package each item. What will you put drink mixes in? How will you present Sugar Cookies? Have a Game Plan – Have a master plan and think about the order of your prep day. So you can maximize your time. You will be amazed what you can get done with a little planning. Tip: Make sure you start baking items that need less time first, and prepare items that don’t need the oven while the other items are in the oven. Make sense? Do you have a great recipe or homemade gift idea? Leave it in the comments below! The toffee (made with saltines) is my hubby’s FAVORITE Christmas treat. He likes it better than any “real” toffee he’s tried. I’ve never tried Cheez-it’s. Interesting. I made the Chai Tea for teacher gifts @ Valentines and it was a hit. Just curious … Teachers: Do you like the homemade treats? Is there anything we can do to make your gifts more special?